Major companies working in eye lens market are Valeant Pharmaceuticals, Novartis International AG, The Cooper Companies, Inc., Menicon Group, Carl Zeiss AG, STAAR Surgical, SynergEyes Inc., Johnson and Johnson, Charenton-le-Pont, Essilor International S.A., and Abbott Medical Optics, Inc. among others. These players have major role in the augmentation of the eye lens market. 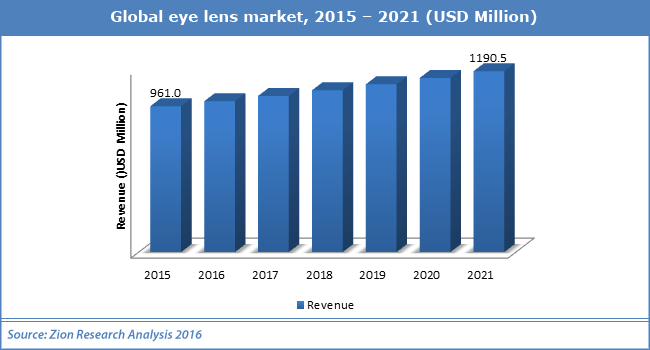 As per the analysts at Zion Market Research, the global eye lens market added up for almost USD 961.0 Million in 2015 and is likely to cross almost USD 1190.5 Million by 2021, developing at a CAGR of almost 4.0% from 2016 to 2021. As per the analysts art Zion Market Research, the eye lens market is augmented by rising demand of cosmetic and soft contact lenses with elevating cases of hyperopia, myopia, presbyopia, and astigmatism. In addition to this, government initiative, rising awareness, and enhancement of health care facilities drive the development of eye lens market. The global eye lens market is boosted by increasing eye issues due to elevated employment of mobiles, computers, and other electronics goods including digital gadgets. On the other hand, issues such as intense perilimbal infection, photophobia, and corneal allergy owing to incessant employment of eye lens are accountable for hindering the development of eye lens market. Nonetheless, untapped techniques for curing ophthalmic disorders are expected to unlock new avenues for the eye lens market. In addition, the entrance of new players in the eye lens market is also set to propel the market growth. For example, in April 2016, Samsung filed a patent on smart contact lenses that can show pictures straight into the eyes of the users. Using these lenses, consumers will be allowed to experience AR, with computer-created pictures. As per the patent, the lens is fitted with a camera, miniscule display, and antenna. Based on areas, eye lens market is divided into Europe, North America, Latin America, Asia Pacific, and the Middle East & Africa. North America ruled the eye lens market with over 30% share and has a sturdy attendance in the market. With elevating incidence of ophthalmic cases, Asia Pacific is likely to witness high development in eye lens market in the forecast period. On the basis of application, eye lens market has been divided as lifestyle, therapeutic, cosmetic, and corrective. With over 40% share, corrective lens segment is dominating the eye lens market. The therapeutic division is the 2nd biggest division in eye lens market and it is likely to create new avenues for the eye lens market during the forecast period.